40th anniversary edition now available - click here for more information. The long awaited blu-ray release of The Rocky Horror Picture Show hit the shops here in the UK on Monday 18th October 2010 with a new DTS HD 7.1 sound track and remastered video. Also included were several new Special Features. atthough strictly speaking the audio commentary with Richard O'Brien and Patricia Quinn seems to be the same one from the DVD release. Lovely animated menu images greet you as the disc loads. I do have one minor gripe about the navigation, the combination of left/right arrows and enter key presses are not very obvious to start and do take a little getting used to, and you are talking to a man with far too many DVD's and blu-ray's already here. The picture. Well in a word stunning. This is the best I have seen the movie since watching the brand new print that Fox ran us for T92. Not a scratch in sight, excellent resolution and it looks like a lot of the footage has been improved. A good example of this is on the bedroom scenes; whilst Janet's room is still the nice red tint, Brad's room gets a more neutral hue, rather than the exaggerated blue of previous releases. The details is so clear you can spot details you've not noticed before and I say that after seeing the movie many hundreds of times over. There is the option to watch both the US and UK versions of the movie, the latter of course having the full version of the song 'Superheroes', which has featured on UK prints since T92. There is also an option to watch the movie in black and white then jumping into colour (as per the Easter egg feature on the previous DVD release). Strictly speaking this is not what was originally intended for the movie. It was meant to be black and white until Frank first appeared, then only his lips were red until the end of 'Sweet Transvestite' at which point the full colour kicked in and remained until 'Superheroes' at the end of the movie. What we do get is black and white until Riff opens the door to reveal the Transylvanian's during the 'Time Warp'. With modern technology it is a real shame that they didn't bother to get this back to the original intention for the film. Sound wise the mix is slightly more subtle than previous versions. On my 5.1 system there was some steering to the effects channels but nothing to distracting or dramatic. Vocals did seem a little clearer than on the DVD release. I'll update this when I've finally saved up enough for a new 7.1 amplifier. As mentioned earlier you can also listen to Richard and Pat's commentary track which tones down the soundtrack where needed and there is also an option for a "Rocky-oke" singalong track which has not only the lyrics highlighted, but also offers the chance to sing with or without lead vocals accompanying you. Nice. Rounding off the sound options is a 2.0 mono soundtrack (surely a contradiction in terms there!) for the purists, well that one bloke in the USA that is always on about it anyway. Extras, and there are quite a few. Well to start with the new ones.....there is the much-hyped "Midnight Experience" track. This option allows you to watch several additions while the main movie runs. You can get prompts for props to use, with of course an American audience participation bias. No bad thing, but squirt water pistols at a stage show here in the UK and you'll get thown out! You can also listen to the old talk back recording which I remember buying on 12" vinyl record when it came out as well as get a trivia track of insights to the movie. There is also the picture in picture shadow cast feature, but more on that later. There is also an interview with the very likeable Mick Rock as well as a gallery of a few of his images of Rocky Horror. A Pressbook and Poster gallery are also of interest to us die-hard fans. Also included are "A few from the Vault", items that appeared on previous DVD releases. Deleted musical numbers 'Once in a While' and 'Superheroes' are here, although 'Superheroes' is of course part of the UK release anyway. Alternate credit endings, with 'Time Warp' music instead of 'Science Fiction Double Feature', as well as the misprint ending where the action is 'Superheroes' but the verse sung in the Narrators one. From 1995 the is the "Rocky Horror Double Feature Show" as well as the footage from the 10th Anniversary convention in New York City. Two trailers are also included as is the Time Warp music video from the 15th Anniversary video release. Last, but not least, the disc also has an option to watch the movie with a shadow cast performing in a small box in the corner of the screen. There is also a two part documentary on the search for the 35th anniversary fan shadow cast, with lots of familiar faces from here in the UK, the USA and Europe. The documentary also features both Patricia Quinn and Barry Bostwick. I really am in two minds about the picture-in-picture shadow cast option. Whilst it is great to see such wonderful performances from the fan cast, the fact that they are placed in a little curtain-framed box in the bottom right of the image looks more than a little strange. One thing we noticed that was missing from the disc was the great "VH-1: Where Are They Now?" documentary as seen on previous releases. Pity they missed that one out. There is also some additional content available via download as a BD live option, but this wasn't working when I tried it on my new Samsung player, even though I have the latest firmware download installed. I'll try again soon and let you know if I have any more luck. To conclude. What better reason to upgrade to blu-ray and a high-def display? An absoluty stunning version of our favourite movie with some very worthy additional features, but could have been just that little bit better in some respects. By the way, what happened to the nice picture book that came with the US release? (London, UK) It's not a time warp, it's the real thing. 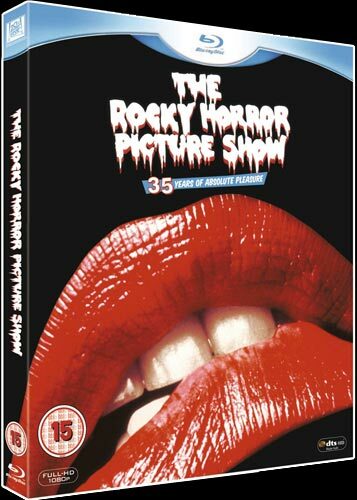 The Rocky Horror Picture Show - the mad mix of classic horror, super-charged sensuality and outrageous fantasy celebrates its 35th Anniversary with a high definition Blu-ray Disc (BD) release on 18th October from Twentieth Century Fox Home Entertainment. Rocky Horror comes to BD for the first time with a newly re-mastered version of the film allowing you to see your favorite scenes like never before and so much more - Frank's tattoo! Fully stocked with BD interactive special features designed for added pleasure this disc provides the ultimate Rocky Horror Picture Show experience at home. Sing and dance your way through The Midnight Experience an interactive/picture-in-picture feature that recreates the all-famous Midnight Movie experience in your living room; sing-along to every tune with the help of the bleeding lyrics found on Rocky-oke: Sing It! ; and go behind the scenes of The Search for the 35th Anniversary Shadowcast with the two-part program Don't Dream It, Be It and An-tic-i-pation! With the featurette Mick Rock (A Photographer) view the intimate reflections from the rock-n-roll photographer who had exclusive access to the set more than 35 years ago. The 35th Anniversary Blu-ray Disc contains all-new BD-exclusive special features as well as A Few from the Vault, a selection of favorites taken from previous releases. Starring Tim Curry (Dr. Frank-N-Furter), Susan Sarandon (Janet Weiss), Barry Bostwick (Brad Majors) and Meatloaf (Eddie), Rocky Horror is the story of an ordinary couple and one unforgettable night at the castle of Dr. Frank-N-Furter, a mad scientist from the planet Transsexual in the galaxy of Transylvania. The Rocky Horror Picture Show was released on Blu-ray on 18th October, courtesy of Twentieth Century Fox. We had two copies of The Rocky Horror Picture Show on bluray courtesy of Twentieth Century Fox to give away the moment it was released to two lucky winners just for answering the following question. Which of these formats gives the highest quality image? Alex Rigg from Wotton-Under-Edge, UK and Jane Payne from Wallington, UK. And there was more........for our November 2010 monthly compeition we also had a copy of the blu-ray for each of our lucky web site winners. All video / images ©1975 Twentieth Century Fox Film Corporation. All Rights Reserved. © 2010 Twentieth Century Fox Home Entertainment, Inc. All Rights Reserved. This page and information © TimeWarp 2010.